Dwight Gayle scored a hat-trick as Crystal Palace moved into the League Cup fourth round with a home win over Championship side Charlton Athletic. Fraizer Campbell put Palace ahead with a low finish just after the break. Gayle then netted a penalty after Campbell was fouled by Alou Diarra, before Naby Sarr pulled one back. Diarra was sent off after another foul in the box, with Gayle scoring again from the spot before completing his hat-trick with a header after a corner. 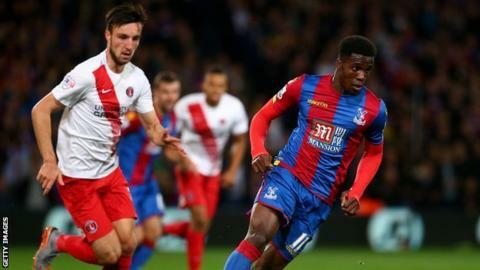 Palace had exited the League Cup to teams from the second or third tier in four of the past five seasons, but this was a potent performance from Alan Pardew's side against the team he managed between 2006 and 2008. Gayle has not started a Premier League match all season, but this display underlined his value to Palace, who had not scored in either of their previous two games. Charlton manager Guy Luzon rested key players Ahmed Kashi, Johann Berg Gudmundsson and Tony Watt as his side suffered a third consecutive defeat in all competitions. The Addicks have not reached the fourth round of the League Cup since the 2006-07 season. Crystal Palace assistant manager Keith Millen: "It's nice to have your forwards scoring. Dwight and Fraizer looked sharp all night. "They both looked dangerous so that will give everyone a confidence boost and it's nice to have some competition for the weekend. "It was a performance that we wanted from the whole team, we had players who needed game time. We want to go as far as we can, we are in the last 16 and it's been a while since we had a cup run." Charlton manager Guy Luzon: "We organised well in the first half, especially with a young team. "But the first penalty was harsh and then after the second, at 3-1 with 10 players, it's finished. I don't know about the sending-off, I was too far away from the situation. "We have a lot of injuries and in our situation we had to use some young players. I wanted to pick my strongest team but I didn't have any choice." Match ends, Crystal Palace 4, Charlton Athletic 1. Second Half ends, Crystal Palace 4, Charlton Athletic 1. Attempt blocked. Lee Chung-yong (Crystal Palace) right footed shot from outside the box is blocked. Joe Ledley (Crystal Palace) wins a free kick in the defensive half. Attempt saved. Dwight Gayle (Crystal Palace) header from the centre of the box is saved in the top centre of the goal. Attempt saved. Yohan Cabaye (Crystal Palace) right footed shot from outside the box is saved in the top centre of the goal. Assisted by Lee Chung-yong. Goal! Crystal Palace 4, Charlton Athletic 1. Dwight Gayle (Crystal Palace) header from the centre of the box to the bottom left corner. Assisted by Lee Chung-yong with a cross following a corner. Corner, Crystal Palace. Conceded by Morgan Fox. Attempt saved. Patrick Bamford (Crystal Palace) left footed shot from the centre of the box is saved in the bottom left corner. Assisted by Dwight Gayle. Corner, Charlton Athletic. Conceded by Adrian Mariappa. Corner, Crystal Palace. Conceded by Johann Berg Gudmundsson. Adrian Mariappa (Crystal Palace) wins a free kick in the defensive half. Foul by Patrick Bamford (Crystal Palace). Zakarya Bergdich (Charlton Athletic) wins a free kick in the defensive half. Attempt blocked. Yohan Cabaye (Crystal Palace) right footed shot from outside the box is blocked. Substitution, Charlton Athletic. Tony Watt replaces Conor McAleny. Substitution, Crystal Palace. Yohan Cabaye replaces James McArthur. Goal! Crystal Palace 3, Charlton Athletic 1. Dwight Gayle (Crystal Palace) converts the penalty with a right footed shot to the bottom right corner. Second yellow card to Alou Diarra (Charlton Athletic) for a bad foul. Penalty Crystal Palace. Dwight Gayle draws a foul in the penalty area. Penalty conceded by Alou Diarra (Charlton Athletic) after a foul in the penalty area. Attempt missed. Karlan Ahearne-Grant (Charlton Athletic) header from the centre of the box is close, but misses to the left. Assisted by Conor McAleny with a cross. Zakarya Bergdich (Charlton Athletic) is shown the yellow card for a bad foul. Wilfried Zaha (Crystal Palace) wins a free kick on the right wing. Attempt saved. Alou Diarra (Charlton Athletic) header from the centre of the box is saved in the top left corner. Assisted by Ahmed Kashi with a cross. Corner, Charlton Athletic. Conceded by Martin Kelly. Goal! Crystal Palace 2, Charlton Athletic 1. Naby Sarr (Charlton Athletic) header from the centre of the box to the high centre of the goal. Assisted by Morgan Fox with a cross following a corner. Substitution, Charlton Athletic. Ahmed Kashi replaces Jordan Cousins. Attempt blocked. Jordan Cousins (Charlton Athletic) right footed shot from outside the box is blocked. Assisted by Johann Berg Gudmundsson. Attempt missed. Patrick Bamford (Crystal Palace) left footed shot from outside the box is high and wide to the left. Assisted by Dwight Gayle. Joe Ledley (Crystal Palace) wins a free kick on the left wing. Substitution, Crystal Palace. Patrick Bamford replaces Fraizer Campbell. Substitution, Charlton Athletic. Johann Berg Gudmundsson replaces Mikhail Kennedy. Goal! Crystal Palace 2, Charlton Athletic 0. Dwight Gayle (Crystal Palace) converts the penalty with a right footed shot to the bottom left corner.